The visual motif of The Revolutionary is built on the rich body of Chinese revolutionary art. Most of the pieces used in the film were acquired from The International Institute of Social History in Amsterdam. Below you can look through some of the more important posters. 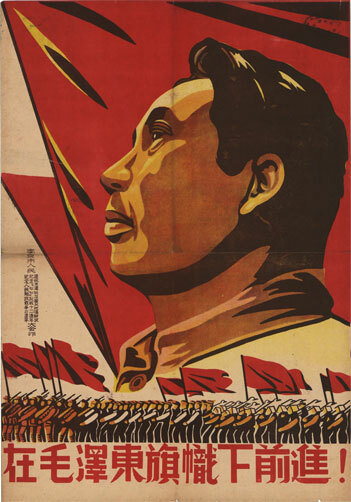 This 1949 poster depicts Mao as the revolutionary military leader. It commemorates the 12th anniversary of the start of the war with Japan where the Communists, led by Mao Zedong, and the Nationalists, led by Chiang Kai-shek, maintained an uneasy true while fighting a common enemy. 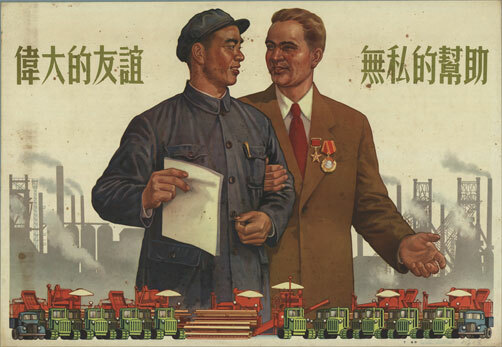 During the 1950s, China received the help of many outside "experts" mostly from the Soviet Union. Sidney Rittenberg was one of the few experts to come from the United States. American Imperialists, Get Out of South Korea! 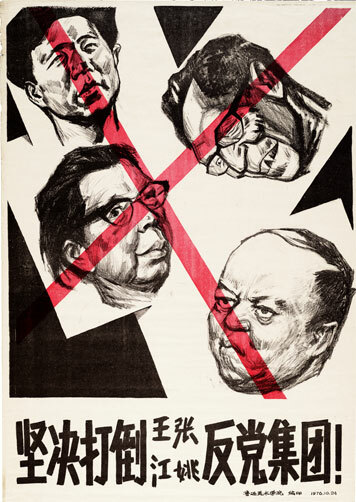 This 1965 poster depicts the animosity the Chinese government felt for the United States. Fighting the US in the Korean War (1950-1953) solidified a division between China and the US that still lasts to this day. 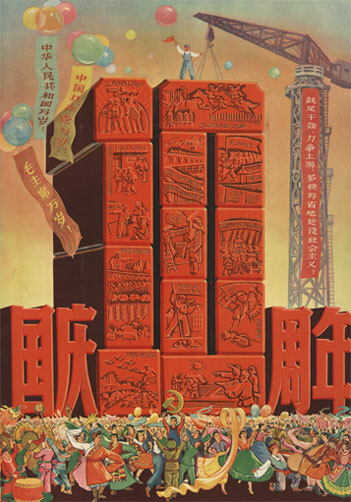 This 1959 poster depicts the call to action for the Great Leap Forward, particularly the collectivization that occurred at that time. 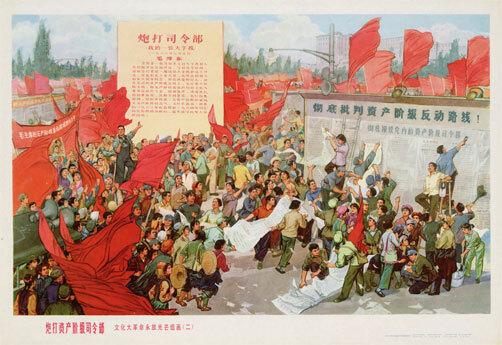 The 10 year anniversary of the founding of the People's Republic of China coincided with the chaos of the Great Leap Forward, Mao's attempt to orchestrate a social change that would quickly develop China into a top industrialized nation. This poster depicts the romanticized dream of that era, in contrast to the tragic reality of an estimated 50 million people dying of hunger. 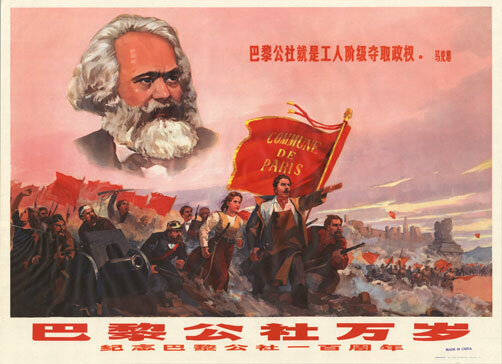 To some participants of the Cultural Revolution, the seizure of power was inspired on the idea of the people's commune, idealized in the Paris Commune of the French Revolution. 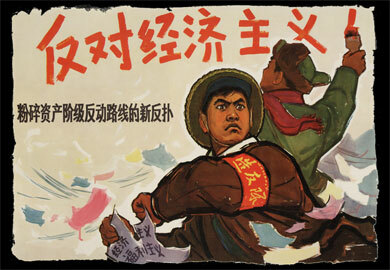 From the inception of the Cultural Revolution, the big character poster played a pivotal role. 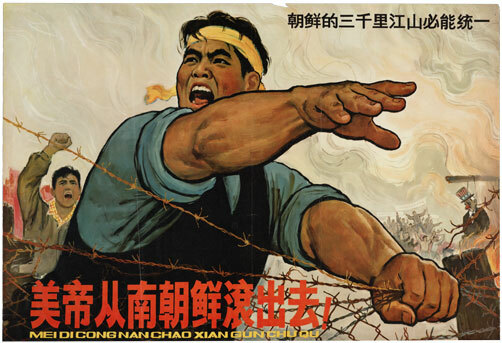 This poster commemorates Mao's famous big character poster in which he called for the new revolutionaries to turn on the Chinese Communist Party, leading to an increase in chaos and violence in the country. 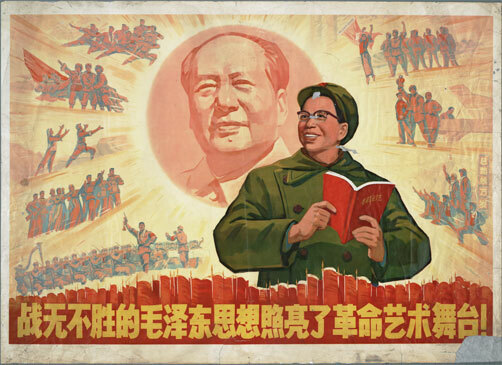 The Little Red Book of Mao's quotations was ubiquitous during the Cultural Revolution. It was interpreted in many ways, and only Mao was the authority to what was correct. 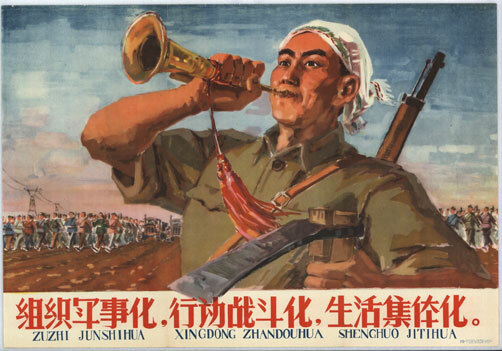 The Cultural Revolution was fueled by the ideological fervor of young Chinese. This poster depicts the intensity of the time, but doesn't come close to revealing the extraordinary violence that occurred. 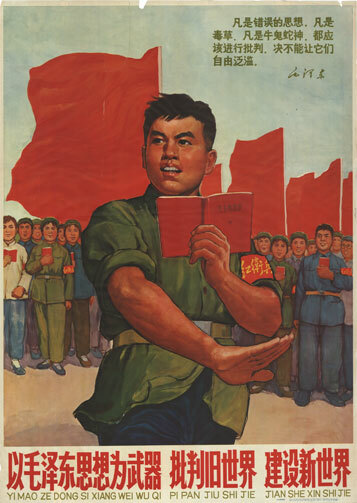 The Invincible Thought of Mao Zedong Illuminates the Stage of Revolutionary Art! Mao's wife, Jiang Qing, was a former movie actress and promoted the arts. But during the Cultural Revolution she became prominent in politics as a member of the Gang of Four, and a nemesis of Sidney Rittenberg, finally causing him to be thrown into prison. Forge Ahead under the Command of Mao Zedong Thought! 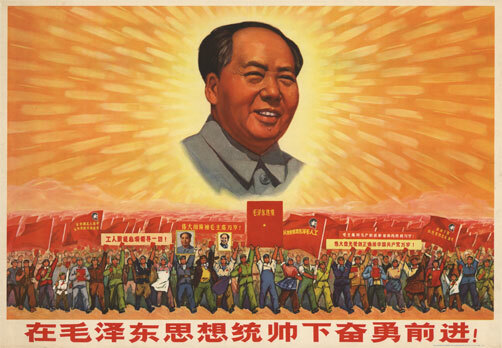 During the Cultural Revolution, Mao became a godhead. His word was law, and having defeated his enemies in the Party, his power was absolute, and his edicts were carried out by the Gang of Four. 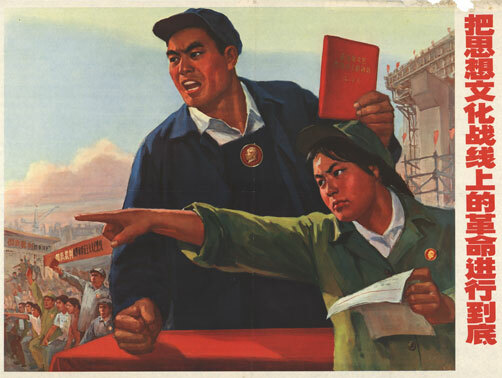 Resolutely Overthrow the Anti-Party Clique of Wang, Zhang, Jiang and Yao! In 1976, Mao died and his hold on power in China was gone. The Gang of Four, detested by many, were quickly overthrown. Sid's nemesis, Jiang Qing, was thrown into prison, and Sid was soon released.